With over 50 years of HVAC experience, AAA Heating & Cooling is ready and able to assist with any commercial heating and cooling needs you may have. Our thoroughly-trained and professional service technicians are prepared to get the get the job done in order to keep your commercial HVAC unit running efficiently and save you money on overhead costs. With AAA Heating & Cooling, satisfaction is guaranteed. We offer commercial service, repair, maintenance, design, installation, and duct cleaning services for Portland and Vancouver businesses. Find out more about our commercial offerings below! We understand how important it is to keep your business climate-controlled at all times. AAA Heating & Cooling offers maintenance services for commercial furnaces, air conditioning units, rooftop HVAC systems, heat pumps, split systems, and control systems. Our highly-skilled team can administer routine service checks and assist with any commercial HVAC malfunction you may be experiencing. We even offer 24-hour emergency service for last-minute heating and cooling needs. The durable commercial HVAC units from AAA Heating & Cooling are designed to provide dependable heating and cooling for years. However, some commercial systems will become less reliable over time. If our technicians are unable to fix the problem during a repair appointment, we can help you design a completely new system. If your commercial HVAC unit needs to be replaced, the expert heating and cooling design specialists at AAA Heating & Cooling will guide you through the process of selecting a new system for your business. They will visit your commercial building to assess the space and design a custom heating and cooling system that meets the unique needs of your business. In addition, our installation department provides the best commercial service in Portland and Vancouver. Our technicians work with city and metro inspectors to ensure that your commercial HVAC installation project is seamless. AAA Heating & Cooling also provides duct cleaning and filter changes for commercial HVAC systems in Portland and Vancouver. Air ducts and filters can get clogged with dirt, dust, and debris, which can obstruct airflow and have a negative impact on indoor air quality. Regular duct cleaning and air filter changes will keep your commercial HVAC system running efficiently, which will save you money and improve air quality. 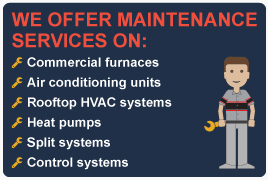 For more information about the commercial services offered from AAA Heating & Cooling or to schedule an appointment, contact us today!